Across the Muslim world, stories and anecdotes attributed to or about Nasreddin Hodja are as much a part of the collective consciousness as the Grimm’s Fairy Tales in Europe and North America. 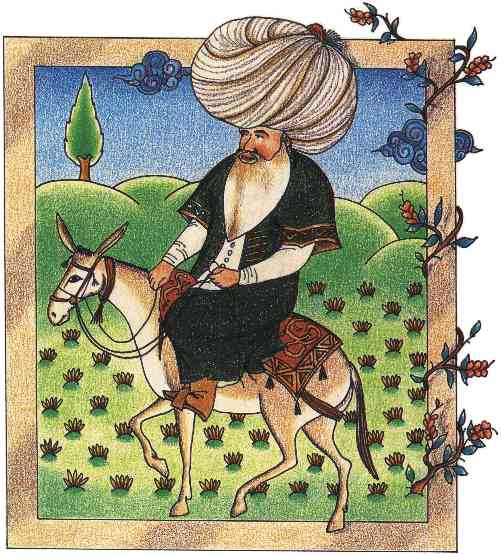 Nasreddin was probably a real man who lived in Turkey in the 13th century. Some sources say he was born in Turkey, others that he moved there from Iran. In any case, it seems agreed that he lived and worked as a judge and teacher in Aksehir, near the city of Konya in central Turkey. He is known for his sly wit, appreciation of the absurd, optimism and genial nature. The honorific Hodja refers to a wise teacher.